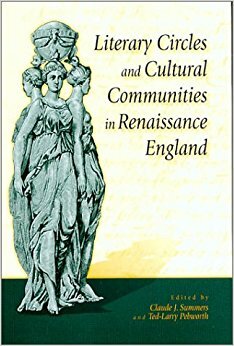 Claude J. Summers, Ted-Larry Pebworth, "Literary Circles and Cultural Communities in Renaissance England"
Although the literary circle is widely recognized as a significant feature of Renaissance literary culture, it has received remarkably little examination. In this collection of essays, the authors attempt to explain literary circles and cultural communities in Renaissance England by exploring both actual and imaginary ways in which they were conceived and the various needs they fulfilled. The book also pays considerable attention to larger theoretical issues relating to literary circles. The essayists raise important questions about the extent to which literary circles were actual constructs or fictional creations. Whether illuminating or limiting, the circle metaphor itself can be extended or reformulated. Some of the authors discuss how particular circles actually operated, and some question the very concept of the literary circle. Literary Circles and Cultural Communities in Renaissance England will be an important addition to seventeenth-century studies.